The use of the operating microscope for microsurgery in the 1970s has lead to the continued expansion of such technology in the operative management of male infertility and chronic testicular or groin pain. With greater patency rates and fertility rates of vasovasostomy performed with the operating microscope, the concepts of magnification have been successfully applied to vasoepididymostomy and varicocele ligation as well. More recently, microscopic spermatic cord neurolysis or denervation has demonstrated applicability to the treatment of groin and testicular pain. These procedures are technically demanding. The melding of improved visualization with magnification to an ergonomic platform that can be operated remotely has intuitive benefits to testicular and reproductive microsurgery. Robotic assistance during surgical procedures has been utilized in a wide array of surgical fields with the above-mentioned benefits. 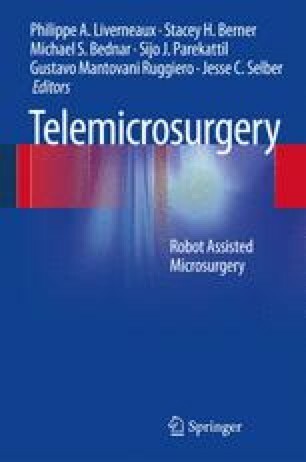 This chapter covers the latest developments in the robotic microsurgical platform, robotic microsurgical tools and current evaluations of various robotic microsurgical applications for male infertility and patients with chronic testicular or groin pain.